A new hardcover edition of Neil Gaiman's Newbery and Carnegie Medal-winning novel, The Graveyard Book, as part of the new Harper Classics line. This Harper Classics edition of The Graveyard Book includes the complete original book as well as Neil Gaiman's Newbery acceptance speech; handwritten pages and sketches from The Graveyard Book; and a reading group guide. Nobody Owens, known as Bod, is a normal boy. He would be completely normal if he didn’t live in a graveyard, being raised by ghosts, with a guardian who belongs to neither the world of the living nor the dead. There are adventures in the graveyard for a boy—an ancient Indigo Man, a gateway to the abandoned city of ghouls, the strange and terrible Sleer. But if Bod leaves the graveyard, he will be in danger from the man Jack—who has already killed Bod’s family. 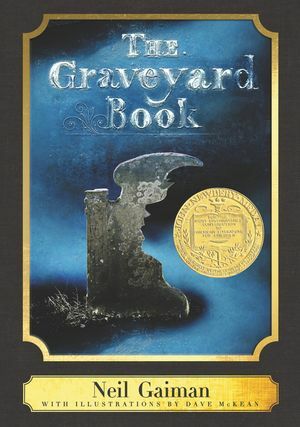 The Graveyard Book, a modern classic, is the only work to ever win both the Newbery (US) and Carnegie (UK) medals. A New York Times bestseller. The Graveyard Book is everything everyone loves about Neil Gaiman, only multiplied many times over, a novel that showcases his effortless feel for narrative, his flawless instincts for suspense, and above all, his dark, almost silky sense of humor.